Nina Ultra Pro in Purple Xing. Top is natural light (indoors), bottom is flash to show the hologram glitter. I don't think I've posted anything from my Nina stash yet! So, why not start out with the best one? I love this polish. It combines two of my favorite things: purple and holo glitter. I think it looks amazing. It's a little sheer but I think it's worth it to do the three or four coats it needs. The name had me confused when I bought it... I'm like... what is this? Xing? Kissing? Crossing? X-ing? And then it sorta dawned on me- maybe it's supposed to be "perplexing"? I love polishes with crazy names. Nina has some pretty cool polishes, I think I need to try more of them. The colors never wow me on the display but when I pick up the bottles and examine them I usually find some cool detail I like about each color. The bottles don't really jump out at me, I'm a sucker for nice packaging and I suppose my eyes just glance over the plain generic round bottle. Reminds me of the Seche bottle or the old Sinful bottle. Very nice selection! I've never seen this brand in person. I agree, jelly and holo glitter is the bomb-diggity! Maybe it's Purple Zing? LOL Who cares?! It's a pretty color. I have their Caribbean Blue and it's SOOO pretty. I'm with you - I tend to overlook them because they're so meh in their packaging. I have this one too, and it is stunning! I bought mine at Sally's on a whim, and boy am I glad I did. I have two other Nina polishes from the Christmas collection last year, and they are beautiful as well. Oh that is such a pretty polish! It's like what Milani's Shimmering Purple wants to be when it grows up. Nice job figuring out the name too! I would never have made that connection! It does remind me of the old Sinful (found one or two in the Carribean when I was on a cruise at some no name polish place) bottles... but pretty! I probably passed this up, not knowing it was a holo! That's a really cool, unusual purple polish! I love the glitter! 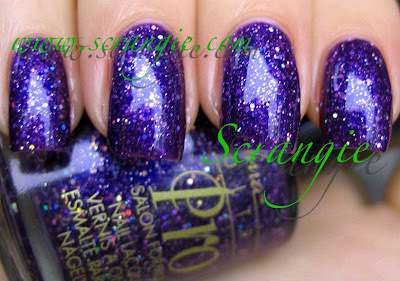 I think the name really suits the polish in an odd way ;) Nice post! "Xing" means star in chinese! Wonder if that's what it meant. OH! Perplexing! That makes sense! Ugh, I always wondered about the name... anyway, I love that polish oodles and it's really cool to see it featured! That's probably what it is Perplexing. Nice observation! I never would of figured that out. I always just call it Purple Icing...don't ask. I know I'm a little late to the party here but I have to ask - how did you get the smooth finish with this polish? I have two coats of topcoat over it and it's still gritty! Yeah I'd totally wear a green one like this one! Looks great! Oh dear I hate to be Anon but my computer is giving me issues. Tonight it was this polish, he dug deep to find a purple glitter I don't have since I horde purple glitters like mad. Strangely there are differences and I was wondering if it's just me or if they changed the formula. I have it in the new bottle. More modern, rounded all over with a nice top. It has an extremely wide brush though. So beware to anyone who has issue with them this one is wiiiiide. The formula, at least in my bottle, was extremely thick. So thick I can't use it unless I add a good amount of thinner. The name is still the same of course but the polish to me is much more purple then your beautiful photos. So if anyone else has picked this up in the new packaging let me know if it's just me? It still has the lovely halo-glitter combo. I am going to be on the look out for the old version just becuase I am so curious about why mine looks and acts so different.